If you find the constant hum of a window AC unit even more annoying than the heat in the summer, maybe it’s time to consider an unorthodox alternative like a giant heatsink dining table that promises to cool a room to a pleasant 71 degrees Fahrenheit. 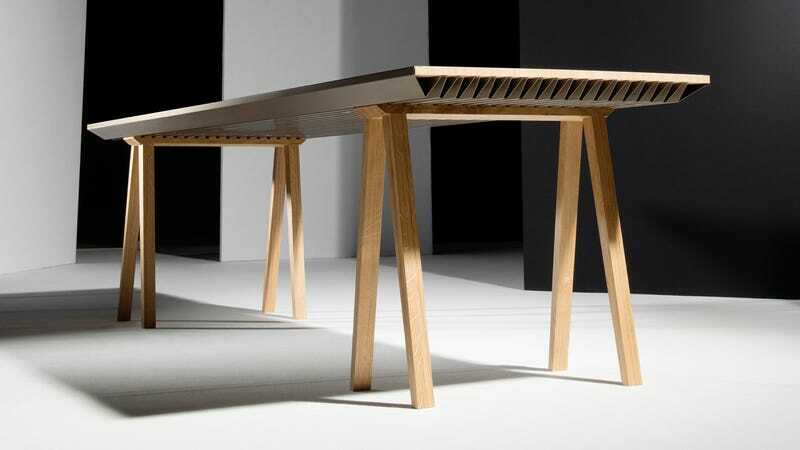 Described as a thermal sponge, the ZEF table works not unlike the ridged heatsink you’ll find perched atop a processor inside a computer. On the surface is a stylish solid oak panel, but beneath that is a folded sheet of anodized aluminum with tiny wax balls filling the gaps in-between. The wax balls function as a phase-change material, and are able to absorb and hold large amounts of heat from the surrounding area which helps to cool a room in the summer, but also heat it in the winter. However, the ZEF table is actually designed to work alongside air conditioning and heating units and improve their efficiency, not replace them entirely. The table’s creators claim the ZEF’s design could help reduce cooling needs by up to 30 percent when it’s hot out, and reduce heating needs by as much as 60 percent when temperatures outside get frigid. But why stop at just a temperature-regulating table? The ZEF’s creators actually want to create a whole eco-system of complementary products so that everything from sofas to entertainment centers could be all helping to help make your heating and cooling bills more reasonable.